Smashed teeth, a torn lip and broken collarbones are among the injuries to cyclists who say they all went over the same pothole. The four cyclists say they were hurt at a spot near Gnosall in Staffordshire. The injuries - including a slashed elbow - happened in separate incidents over a three-week period. The local authority says it has fixed the issue - one of about 20,000 potholes it deals with annually across a road network of 6,000km. More stories from across Staffordshire. Greg Dancer is among those seeking compensation for the injuries sustained last November. 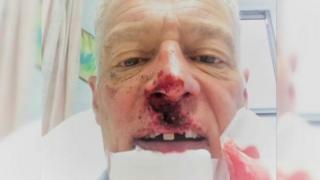 He said he knocked out his front teeth and tore his top lip when he "took the centre line" on a flooded road - injuries that left him "drinking through a straw". Paul Rowlands said he was hurt a week later, breaking his collarbone and some ribs when he was "catapulted over the handlebars". He said he was "practically unconscious" and lying in water because of the cavity which, he said, he reported. Glen MacDonald-Jones said a week after that, he boosted the pothole's injury toll with a slashed elbow, adding a fourth cyclist broke his collarbone two days later. He said a flooded road meant he kept to its centre apex but the next moment, he was on his back. The group says it wants to bring legal action against the local authority. Mr Rowlands said: "Clearly we want some compensation for our injuries and for the damage to our bikes, but ultimately we want Staffordshire County Council to sort out the roads so as they're safe for everybody." The authority said pothole repairs were prioritised according to the risk posed to the "travelling public", with reported defects "inspected as soon as possible". It added it aimed to deal with defects posing "immediate risk" within seven days, with "lesser priority potholes" addressed when resources became available.